Demystifying Identity in the Cloud: What Are the Issues? As a live attendee you will have the opportunity to take part in compelling votes which will ultimately shape the direction of the discussion. Post live questions and join the conversation and network with these information security experts. Do companies really need Cloud Identity? What's the difference between Access Management in the Cloud and Cloud IdM? Uncover the details of why companies are or are not migrating critical data into the cloud and take away the best practices of Cloud Identity. Join Peter Cummings, founder of the Identity Management Specialist Group, Shash Patel, Director, Information Risk Management & Privacy, Air Products and Anish Mohammed, London Chapter, Royal Holloway University of London Information Security Group as they dive into Identity Management in the Cloud and discuss the issues and risks involved. 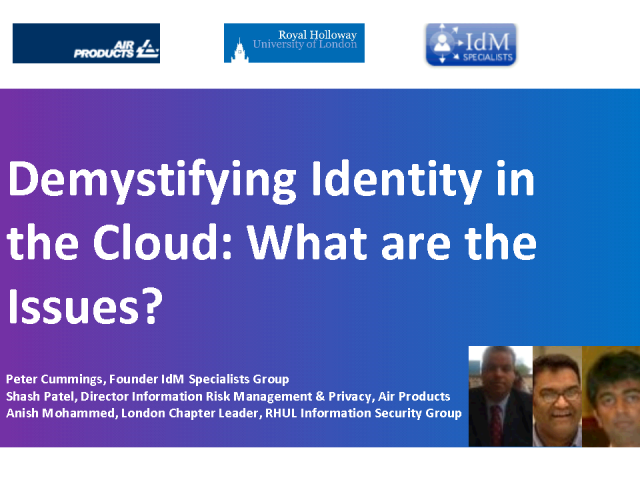 Title: Demystifying Identity in the Cloud: What Are the Issues?